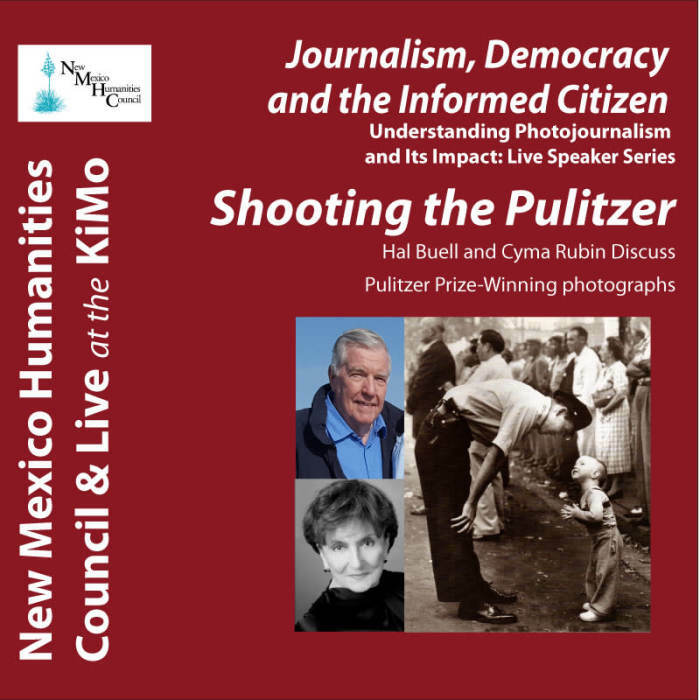 Albuquerque, NM – The Pulitzer Prize, one of the world’s most prestigious awards made annually for excellence in journalism and the arts, will be the subject of Shooting the Pulitzer, a visual presentation on the Pulitzer’s awards to news photography. Famous Pulitzer pictures from World War II to the present will be highlighted. Hal Buell, former head of the Associated Press’s (AP) worldwide photo service, has covered stories in 35 countries during his AP career and headed the wire services photo operation for 25 of his more than 40 years with AP. During Buell’s tenure as head of the AP picture service, AP staff won 12 Pulitzer Prizes, plus other national and international awards for photography. He has authored numerous books, including MOMENTS: The Pulitzer Prize-Winning Photographs and was a two-time member of the jury that selects the winning photos for the Pulitzer Prizes. An appreciation of the importance of photojournalism will be the subject of Hal Buell’s presentation. He will offer special insight into visual literacy in a world of staggering photo content that flashes across the media and the internet. In his fully illustrated presentation, Buell describes how the picture was made and the obstacles the photographer faced often at great risk. In some cases, via a video clip, the photographer describes his story, the environment and the challenge encountered to freeze a particular moment in time. Hal’s presentation will offer a stimulating look at journalistic ethics and taste. Time will be allotted for audience engagement, Q&A. Join us on Thursday, September 27, 2018 at 6:00 pm at the historic KiMo Theatre, 423 Central Ave NW, Albuquerque. This program is FREE and open to the public. The New Mexico Humanities Council seeks to engage New Mexicans with history, culture and diverse humanities topics through public programming. Learn more at https://ddei3-0-ctp.trendmicro.com:443/wis/clicktime/v1/query?url=www.nmhum.org&umid=96364998-728E-D305-8C79-0466054F4BF3&auth=f0ebcd052f61e7a39dc93191e8a01d02608499af-1034fe47673da4401882705824f3afea83d7cfee. Join us for exclusive, private receptions celebrating icons of Pulitzer Prize-winning photojournalism, Hal Buell and Don Bartletti. This is an intimate event; tickets are limited. Tickets include VIP seating to the presentations following the reception. Special ticket price for media/press (we appreciate you!). Receptions take place in Albuquerque at the historic KiMo Theatre Gallery. 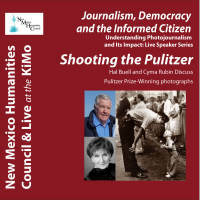 Consider choosing a Humanities Hero ticket and support NMHC programs like this throughout New Mexico! Over his long career, Hal Buell, former head of the Associated Press's worldwide photo service, has covered stories in 35 countries and headed the wire service's photo operation for 25 of his more than 40 years in the business. He has authored numerous books, including Moments: The Pulitzer Prize-Winning Photographs. Cyma Rubin, Tony and Emmy award-winning producer, director and writer will join Buell in conversation during the Shooting the Pulitzer program AT 6:00 pm following the reception.